Resurrection set to music by Richard Rodgers. 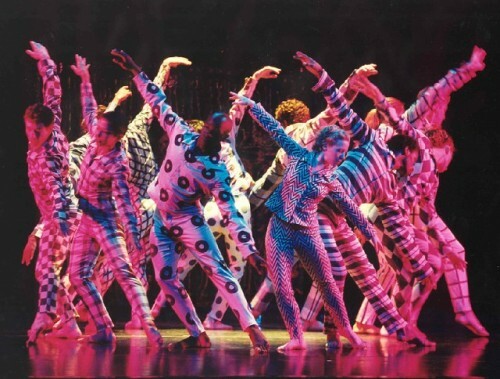 Images courtesy of Mark Morris Dace Group and Jacob's Pillow. Dancing Honeymoon to a medley of 1920s and 1930s tunes. The blue group in V.
The dance season in the Berkshires has been book ended by the Mark Morris Dance Group. In recent years they have become a franchise attraction at Tanglewood where they appeared June 28 & 29. The company is closing the Jacob’s Pillow season in the Ted Shawn Theatre August 24 to 28. Mark Morris, celebrating the 30th anniversary of his company has a long association with Jacob’s Pillow. Arguably the company is one of the most successful in the dance world. Evidence of this is its ability to sell out both Berkshire venues during a single season. It also presented audiences with the opportunity to see two very different and equally enjoyable programs. He has created some 130 dances of which 25 are in the current repertory of the company. This season Berkshire audiences were presented with eight works or about a third of what is currently being performed. The Tanglewood appearance also included the world premiere of Renard set to music of Stravinsky. In the Pillow program the range of works was spanned by the solo Ten Suggestions, from 1981, through Resurrection, 2002. The first half of the program Resurrection (2002), Ten Suggestions, and Dancing Honeymoon featured the witty, humorous aspect of his choreography. After an intermission the second half of the program featured V (2001) a work that is no less inventive, fresh and surprising but conveying the more formalist mode of his work. So there was a yin and yang symmetry between amusing pieces that delighted the audience during the first part of the program, then a challenging classic of contemporary dance. There was a delightful Broadway sensibility for Resurrection set to “Slaughter on Tenth Avenue” by the master of musicals Richard Rodgers. An earlier ballet featured original choreography by George Balanchine. The dance occurs near the end of Rodgers and Hart's 1936 Broadway musical comedy On Your Toes. It is the story of a hoofer who falls in love with a dance hall girl who is then shot and killed by her jealous boyfriend. The hoofer then shoots the boyfriend. Slaughter on Tenth Avenue was danced by Ray Bolger and Tamara Geva in the original stage production of On Your Toes, and by Eddie Albert and Vera Zorina in the film version. In Words and Music, the 1948 film biography of Rodgers and Hart, the ballet was danced by Gene Kelly and Vera-Ellen. It is a trope of Morris to rework classics like his playful send-up of The Nutcracker rendered as The Hard Nut (1991). It includes an over the top interpretation of the "Sugarplum Fairies." This summer at Tanglewood he reinvented Renard by Stravinsky which premiered in 1922 with choreography by Bronislava Nijinska. In reinterpreting the classics it is imperative to bring something fresh to the work. In that sense Slaughter is and isn’t faithful to the original Balanchine or its other interpretations. Clearly Morris was having fun. A child like sense of play is key to understanding his mélange of Broadway, ballet, and modern dance. What we experienced isn’t exactly like a Broadway musical. Oh, if only Broadway were so inventive and clever. 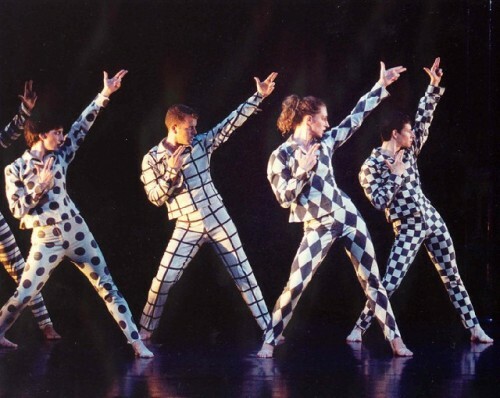 In 1998 Morris brought the choreography for Capeman to the Great White Way. At the time he told a reporter “"I've always liked Broadway shows. As a kid I worked with children's theaters in Seattle a lot doing musicals and it was really fun. I mean, what's better than `Annie Get Your Gun'? Nothing!" Starting with the mottled Commedia del Arte inspired tight pants and long sleeved tops by Isaac Mizarhi and the audience immediately knew it was in for a blast. Add to that a discernable, transparent plot; a cartoon actually about a guy and a dame. We jerked to attention when the ersatz bullets were flying. By the end of the dance there were two dead dudes and a dame with a smoking gun. There was that simply divine recorded score by Rodgers. Remember when you went to musicals and came home humming its tunes? It has been, like, how long since then? In another upbeat, spoofy mood the company, attired by Elizabeth Kurtzman, in leisure wear with pastel colors cavorted about to a medley of 1920s and 1930s pop tunes in Dancing Honeymoon. Morris often likes to introduce unexpected elements for the dance. In this case there were three folding chairs which the dancers interacted with in every possible variation. Including tossing them back and forth. You gasped hoping that nobody would be injured. The dance was originally intended for TV so there were camera angles, including aerial shots not discernible in a staged version. How to explain those Busby Berkeley elements when the dancers formed a circle on the floor and executed coordinated kicks. To an overhead camera it would have made perfect sense while here is was a goof that the audience recognized and laughed at. In another sequence the chairs were set up side by side and the dancers formed quick moving lines sitting briefly then rolling in and out. It was another vignette that channeled Depression era movie musicals and their casts of countless gorgeous gals. They were accompanied by live music featuring the soprano Danya Katok. As we listened to the lyrics of the fourteen vintage songs there were corresponding movements and punctuated accents that allowed for a running commentary. In between these ersatz Broadway routines was a stunning solo Ten Suggestions. When first created in 1981, 30 years ago, it was performed by Morris. The incredible honor of filling his shoes now falls to the remarkably fluid and galvanic Amber Star Merkens. Some years back, before his retirement from the stage, we were always astonished to see Morris dance. He never had what one thought of as the paradigmatic dancer’s body. Near the end of his career we recall a solo in top hat and white tails, a kind of soft shoe routine, that was simply astonishing. After that performance in Boston, under the former Dance Umbrella, we were surprised when Morris and his dancers showed up for beers, bratwurst and cigarettes at Jake Worth’s a short walk from what is now the Emerson Majestic Theatre. Watching the wonderful solo of Merkens inspired vivid memories of Mark. She treats the role with reverence but not as sacrosanct. The early dance has all the signature elements. There is the intimate relationship between movement of Merkens and the staccato, percussive playing of Alexander Tcherepnin “Bagatelles, opus 5” by Colin Fowler. There was a neat, uncluttered, one to one melding of the solo piano with the solo dancer. And the clever use of props. After dancing independently she picked up a hoop hanging on a simple wooden chair. She engagingly explored every possible use of the hoop including passing through it back and forth. That was followed by varied interactions with the chair. Merkens picked up a length of yellow ribbon which she tossed about several times. With a surprising move she produced a pair of scissors and cut the ribbon. The audience gasped in surprise. The final prop entailed a hat which she eventually dropped to the ground and kicked away. By the end of the dance the audience roared its approval. After intermission a different mood prevailed with the master work V (2001). Based on Robert Schumann and a quintet of two violins, viola, cello and piano it sharply emphasized the importance and variety of music as the impetus of the choreography. The range of musical interests for Morris is deep and diverse. Compared to the Broadway and pop aspects of the first part of the program (minus Ten Suggestions) the music of Schumann set a very different challenge for the choreographer and dancers. It is an ambitious big piece that entails a total of fifteen dancers. There was a lot to absorb with complicated configurations and partnering. It is a work that begs for multiple viewings and is difficult to understand in one exposure. The same kind of invention prevailed that we found in the other works but without the release of humor. Some aspects of the work stretched the limit of surprise and irony but one would not describe them as humorous. During one segment, for example, we see the dancers crawling about the stage. It is something we have rarely seen in dance and certainly not in this context. While it may strike one as eccentric it was in sync with the music. It prompted us to listen attentively as the movement is inspired by but also leads us back to the instruments. Initially we regarded several dancers in blue costumes by Martin Pakledniaz. Men and women were equally outfitted with boxer shorts and loose fitting silky tunics. After an interval we were surprised when another, differently attired group of dancers emerged. They were set off by pastel pants and t-shirts. This demarcation contrasted the blue group and the other, shall we say, pastel group. At certain times, when all of the fifteen dancers were on stage, they formed a fluid V. Which we assume inspired the title of the piece. Because the work was essentially abstract and formalist with no attempt at narrative we are left on our own as to why Morris divided them into two groups. Differences in dancing and patterns of movement were not so readily defined. The program left the audience feeling enriched and satisfied. In its depth and variety it rewarded us on every level. At least in the Berkshires it seems that one can never get enough of the Mark Morris Dance Group. Yet again, the exquisite company left us wanting more. For the Pillow that means a long winter and sweet dreams.